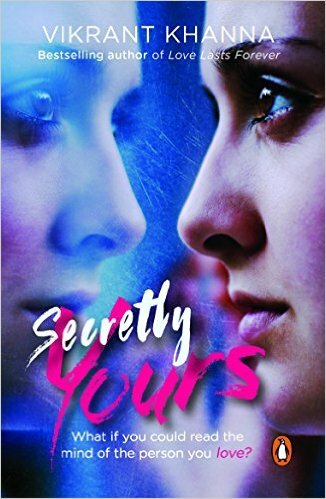 Secretly Yours, is a story of Sahil and his complex life. Orphaned at birth, seventeen year old Sahil has always blamed himself for his parents' death. Has distorted relationship with his siblings and granny. His bad grades and distorted school and studies. But when he meets Anya, his life changes for better but again with lot of twists and turns. He loves Anya but she does not reciprocate but then an accident leaves him in a coma and when he wakes up he makes a startling discovery that he can read minds! Sahil is a sad soul who has a knack for writing and music which actually keeps him going. And when Anya comes in his life, he turns head over heels on Anya. But does Anya actually love him or is she really playing with his heart? What dos she really think about him? Will he be able to make Anya fall in love with him? Is Anya really what she looks like? The otherwise happy go lucky girl, has some secrets. But what are they? What is it with her friends? How do they know? But what do they know? Where does she live? What does she really do? First some secrets, then shocking revelations and finally war; war between relations, life & death, logic and emotions. Secretly Yours will make you question what you see and who you trust. Is seeing really believing or everything we see and perceive is just another mystery? To get answer to all these questions you gotta read "Secretly Yours" by Vikrant Khanna. Vikrant Khanna has written the story in present tense and in a very simple way. It's an easy read, you can connect easily with the story and is good for any age for its simple usage of words barring a few typo here and there. Sahil is the narrator. The only thing is that while reading it I felt its not something new, I could relate some of its characters to some characters of the Twilight series. The story is little predictable but okay for one time read. Initially the story starts slowly but later after three to four chapters it becomes interesting with respect to pace and how the story is weaved. People who have not read or seen the Twilight series by Stephanie Meyer, this story is cool for one time read. Vikrant Khanna has portrayed the characters and the places / areas used in the story very well. Shimla is well described. Also as you read it you want to do nothing but travel to Shimla. Vikrant Khanna is a captain in the merchant navy. When he is not busy working or penning down his ideas, he likes to capture the beauty of nature on his camera. He was brought up in Delhi. His first book "When life tricked me", published in 2011, is a national bestseller and has been widely appreciated by young readers. His interests apart from writing include playing the guitar, composing songs and cooking. What got me thinking: What if you could read the mind of the person you love? My favorite line: When you love someone, you give them the divine power to decide the fate of your life. P.S. This review is a part of the biggest Book Review Program for Indian Bloggers. Participate now to get free books!